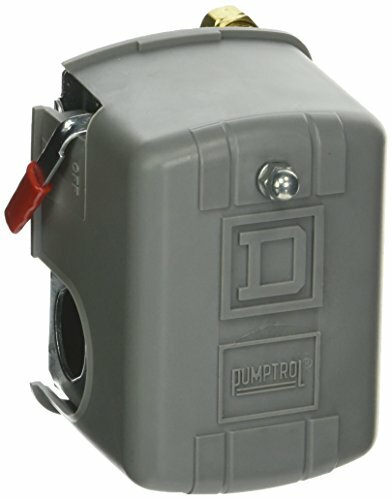 This Square D Pumptrol 9013FHG32J52M1X air-compressor pressure switch controls an electrically driven air compressor in a power circuit when the adjustable threshold upon falling is reached and is set to turn off at 125 psi. The switch has a 1/4" NPSF internal fluid connection and is suitable for use with a higher-horsepower motor with 2 hp or greater. The non-adjustable differential is 30 psi, and the adjustable cut-out range is 70-150 psi. The switch is diaphragm actuated and has a fixed differential. The threshold, or setting point, upon rising adjusts with a screw nut. The switch has screw terminal electrical connections, and two 2-pole NC contacts open on rising pressure. The enclosure is National Electrical Manufacturers Association (NEMA) Type 1 and Ingress Protection (IP) 20 rated. The switch is Underwriters Laboratories (UL) Listed and Canadian Standards Organization (CSA) certified. This switch includes a 2-way pressure release valve. The maintained manual cut-out lever has auto and off positions. Square D Pumptrol pressure switches are manufactured by Schneider Electric.